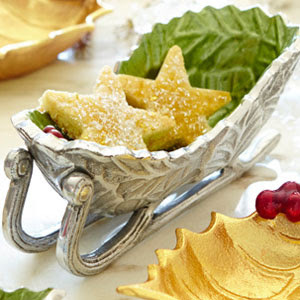 The Julia Knight holiday metalware collection includes a lovely assortment of reds, greens, whites and metallics. Each piece is individually made by hand from sand cast aluminum. The artisans sculpt, polish and finish with a proprietary blend of enamel and crushed mother of pearl powder. The final layer is hand painted to create one of a kind, capiz style swirls. From holly sprigs, trees and leaves to poinsettias, pine cones and acorns, the Julia Knight holiday collection will create a sophisticated tabletop collection for any holiday celebration.